Cleaning out a closet, I found a quilt my mother-in-law hand-stitched. I decided to display it as a wall hanging in our family room as a memorial to her. It was simple to machine wash and line dry. I sewed wooden rings to one end and tied on some twine to hang it neatly. The quilt is a conversation piece. Everyone that visits inquires of it's history. I enjoy telling it and feel proud that her handiwork and her legacy is alive in our home. found them for several years. I am in the midst of a kitchen remodel and started to yard sale these beauties. I decided to refresh them instead. 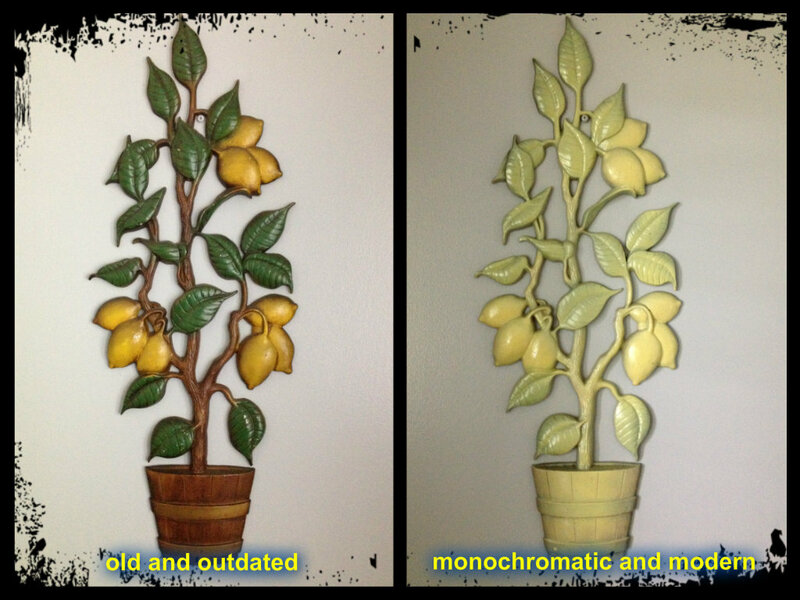 They went from "old and outdated" to "monochromatic and modern" with a fresh coat of spray paint! What do you think? Like it better old or modern? ﻿Finally, I created an heirloom from family history. My in-laws celebrated their 50th wedding anniversary in 1994 . I requested an official greeting for them from the White House and framed it. My mom and dad celebrated their 50th wedding anniversary in 2008. I requested a greeting for them from the White House also and framed it. I have these displayed in our home! My hope for my daughters is they will be able to request a greeting for me and their dad when we celebrate our 50th in 2035. I hope my grandchildren will be able to request their parents' greeting when they've been married 50 years. Isn't that a wonderful legacy to follow? You also get a piece of U.S. History too! My in-law's greeting was signed by Bill and Hilary Clinton and my parent's was signed by George and Laura Bush. The official greeting is also FREE (or it was when I got these). **Please note the backlog for these requests are piled up at the White House. As directed in the "how to" link to request an official greeting above, request at least six to ten weeks prior to your event. 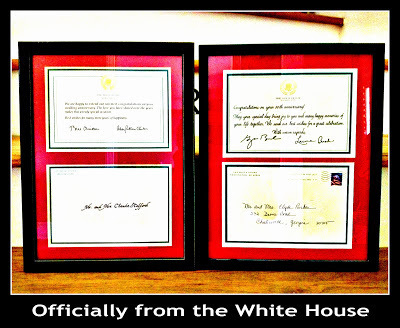 Let me know if you have already started your heirloom with these White House greetings. Beautiful quilt. I love the display! Thanks Mary! Glad you're back and visiting me. I can't wait to share again at Tuesdays with a Twist! See you soon.